The UN Millennium Declaration in 2000 provides the framework for HDR. The Report lists 8 Millennium Development Goals, endorsed by all members of the United Nations, set out a series of time-bound and quantifiable targets ranging from halving extreme poverty to halting the spread of HIV/AIDS by 2015. The Millennium Declaration, made during the UN Millennium Summit on September 8, 2000, was signed by 189 countries, including 147 Heads of State and Government, and included eight Goals called the MDGs. These summarise the key development goals embraced by the main international conferences and world summits during the 1990s, and are declarations of solidarity and determination of the world leaders to rid the world of poverty and improve the lot of humanity. MDGs and related targets and indicators provide a framework for planning policy interventions and benchmarks to monitor progress in human development and poverty reduction. The first target under this goal is to halve the proportion between 1990 and 2015 of people whose income is less than $1 per day. Thus the Millennium Development Goals (MDGs), made during the UN Millennium Summit on 8 September 2000, stand for solidarity and determination of the world leaders to rid the world of poverty and improve the lot of humanity. The goals inter alia call for reducing by half the proportion of people living below the poverty line; reducing by half the proportion of people who suffer from hunger between 1990 and 2015; ensuring that, by 2015, children everywhere, boys and girls alike, will be able to complete a full course of primary schooling; eliminating gender disparity in primary and secondary education, preferably by 2005 and at all levels by 2015; reducing by two thirds, between 1990 and 2015, the under-five mortality rate; reducing by three quarters, between 1990 and 2015, the maternal mortality ratio; halting and reversing the spread of HIV/AIDS and incidence of malaria and other major diseases by 2015. It also emphasized on integrating the principles of sustainable development into country policies and programmes and reversing loss of environmental resources; reducing by half the proportion of people without sustainable access to safe drinking water and improved sanitation; achieving significant improvement in lives of at least 100 million slum dwellers, by 2020. It also stressed on developing further an open trading and financial system that is rule-based, predictable and non-discriminatory, with a commitment to good governance at both national and international levels, development and poverty reduction – nationally and internationally; dealing comprehensively with developing countries? debt problems through national and international measures to make debt sustainable in the long term; in cooperation with the developing countries, developing decent and productive work for youth; providing access to affordable essential drugs in developing countries in cooperation with pharmaceutical companies; and making available the benefits of new technologies – especially information and communication technologies in cooperation with the private sector. Eighteen (18) targets describe these objectives under the 8 goals (MDGs) in the United Nations? MDG framework of 2003. In the Indian context, 12 of the 18 targets are relevant. The UN framework had 53 statistical indicators to measure the progress towards the 18 targets. India adopted 35 of the 53 indicators for the 12 targets concerning India. A revised indicator-framework drawn up by the Inter-Agency and Expert Group (IAEG) on MDGs in keeping with the recommendations made by the Secretary-General in his report to the 61st Session of the UN General Assembly for inclusion of four new targets came into being in 2008. India has not endorsed this revised framework. Deeper decomposition of the measures of MDG indicators down below State levels could be more revealing of the micro-dimensions of the outcomes, which could help demonstrating precise locales of the problems when spatially mapped. At the sub-national levels, data in respect of most of the MDG indicators are not available below States. In some cases only national estimates are available. State-level estimates as available for a number of indicators however, provide a broader cross-section of the inequalities in progress in different parts of the country including their rural-urban and male-female dimensions, wherever possible. With the deadline for the MDGs on the horizon, progress can be reported in most areas, despite the impact of the global economic and financial crisis. Several important targets have or will be met by 2015, assuming continued commitment by national governments, the international community, civil society and the private sector. That said, progress in many areas is far from sufficient. Redoubled efforts are urgently needed, particularly in regions most behind to umpstart advancement and achieve maximum gains. The world community should take pride in its accomplishments thus far, while building on existing momentum to reach as many goals as possible by 2015 and to realize gains for all. 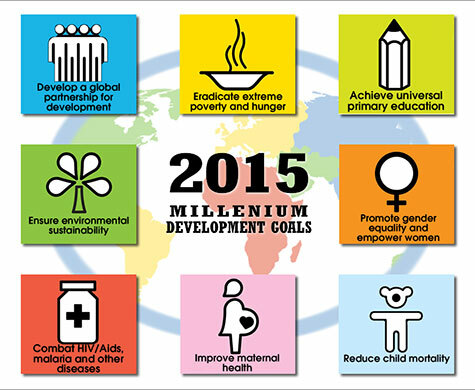 Several MDG targets have already been met or are within close reach. - Poverty rates have been halved, and about 700 million fewer people lived in conditions of extreme poverty in 2010 than in 1990. - The economic and financial crisis has widened the global jobs gap by 67 million people. - One in eight people still go to bed hungry, despite major progress. - Globally, nearly one in six children under age five are underweight; one in four are stunted. - An estimated 7 per cent of children under age five worldwide are now overweight, another aspect of malnutrition; one quarter of these children live in sub-Saharan Africa. New poverty estimates from the World Bank have confirmed last year’s finding that the world reached the MDG target five years ahead of the 2015 deadline. In developing regions, the proportion of people living on less than $1.25 a day fell from 47 per cent in 1990 to 22 per cent in 2010. About 700 million fewer people lived in conditions of extreme poverty in 2010 than in 1990. Extreme poverty rates have fallen in every developing region, with one country, China, leading the way. In China, extreme poverty dropped from 60 per cent in 1990 to 16 per cent in 2005 and 12 per cent in 2010. Poverty remains widespread in sub-Saharan Africa and Southern Asia, although progress in the latter region has been substantial. In Southern Asia, poverty rates fell by an average of one percentage point annually—from 51 per cent in 1990 to 30 per cent two decades later. In contrast, the poverty rate in sub-Saharan Africa fell only 8 percentage points over the same period. Despite this impressive achievement at the global level, 1.2 billion people are still living in extreme poverty. In sub-Saharan Africa, almost half the population live on less than $1.25 a day. Sub-Saharan Africa is the only region that saw the number of people living in extreme poverty rise steadily, from 290 million in 1990 to 414 million in 2010, accounting for more than a third of people worldwide who are destitute. The World Bank projects that, by 2015, about 970 million people will still be living on less than $1.25 a day in countries classified as low- or middle-income in 1990. Sub-Saharan Africa and Southern Asia will each be home to about 40 per cent of the developing world population living in extreme poverty. Around the world, abject poverty is found in areas where poor health and lack of education deprive people of productive employment; environmental resources have been depleted or spoiled; and corruption, conflict and bad governance waste public resources and discourage private investment. The international community now needs to take the next steps to continue the fight against poverty at all these various levels. The slowing of economic growth spells continued job losses, with young people bearing the brunt of the crisis. During 2012, global economic growth slowed even further, substantially weakening the employment generating capacity of national economies. The global ratio of employment to the working-age population declined from 61.3 per cent in 2007 to 60.3 in 2012, after a moderate increase from 2003 to 2007. The top two contributors to the decline in the ratio are falling labour force participation and rising unemployment. According to the International Labour Organization (ILO), unemployment has increased by 28 million since 2007, and an estimated 39 million people have dropped out of the labour market, leaving a 67 million jobs gap as a result of the global economic and financial crisis. From 2007 to 2012, the developed regions registered a 1.7 percentage point drop in the employment-to population ratio. Over the same period, the developing regions experienced a decline of 0.9 percentage points. Within this group, the largest declines were found in Southern Asia and Eastern Asia, which saw drops in the employment-to-population ratio of 2.1 and 1.5 percentage points, respectively. The gender gap in employment persists, with a 24.8 percentage point difference between men and women in the employment-to-population ratio in 2012. The gap is most acute in Northern Africa, Southern Asia and Western Asia, where women are far less likely to be employed than their male counterparts. The differences in the employment-to-population ratio between men and women in these three regions approached 50 percentage points in 2012. 41 per cent of the decline in the global employment to- population ratio since 2007, due to rising unemployment and falling participation The number of workers living in extreme poverty has declined dramatically over the past decade—despite the global financial crisis. Since 2001, the number of workers living with their families on less than $1.25 a day has declined by 294 million, leaving a total of 384 million below this threshold classified as the ‘working poor’. In developing regions, the working poor constituted 15.1 per cent of the employed labour force in 2012, down from 32.3 per cent in 2001 and 48.2 per cent in 1991.
new estimates show that, in addition to the workers that are extremely poor, 19.6 per cent of workers and their families are ‘moderately poor’—living on $1.25 to $2 a day—and 26.2 per cent of workers are ‘near poor’, living on $2 to $4 a day. Altogether, 60.9 per cent of the developing world’s workforce remained poor or ‘near poor’ in 2011, living on less than $4 a day. These figures underscore the urgent need to improve productivity, promote sustainable structural transformation and expand social protection systems to ensure basic social services for the poor and most vulnerable workers and their families. Despite steady gains, one in four children around the world show signs of stunted growth. Stunting in infants and children, defined as inadequate length or height for their age, captures early chronic exposure to under nutrition. Globally, more than one quarter (26 per cent) of children under age five were stunted in 2011. Though still unacceptably high, the percentage represents a 35 per cent decline from 1990 to 2011 (from 253 million to 165 million children). Analysis of the data shows that children in the poorest households are more than twice as likely to be stunted as children from the richest households. In India, there are a number of organizations, institutions and individuals that have estimated the poverty level for the country and its major states. Of these estimates, the Planning Commission estimates are official, periodic and derived by using the consumption expenditure data collected by National Sample Survey Organization. According to some of these previous estimates, the reduction in the poverty level has been quite substantial during 1973-74 to 2004-05 for the country as a whole. For example, the percentage of population living below the poverty line for India has declined from 55% in 1973-74 to 26% by 1999-2000 and further 22% by 2004-05 based on Mixed Recall Period. The pace of decline was not uniform across the states of India as some states experienced a more rapid decline while others had stagnated. In this chapter we have examined the levels and trends in the poverty estimates in India and its major states and have also attempted to project the future scenario. As per MDGs (Report 'Towards Achieving MDGs- India 2013'), Indian is to halve, between 1990 and 2015, the proportion of people who suffer from hunger. At the historical pace of decrease, India tends to reach Maternal Mortality Ratio (MMR) of 139 per 100,000 live births by 2015, against the target of 109, the report said. However according to the report, India is on track on MDGs target of reducing the number of people whose income is less than one dollar a day, between 1990 and 2015. 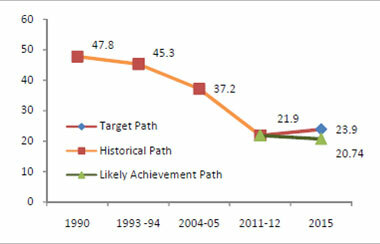 India has already achieved the poverty headcount ratio of 23.9 % and likely to achieve the targeted 20.74 % by 2015. This report entitled “Millennium Development Goals (MDG) India Country Report-2014’ captures the achievements in India as of today under the eight MDGs which are to be achieved by 2015. The year 2014, being the penultimate year for the MDGs, acquires significance in assessing realistically India’s progress in meeting the various targets under the MDGS as well as to take a stock of the areas where the progress is not up to the expected level. According to the latest report of Ministry of Statistics and Programme Implementation on MDGs, the progress over the targets in respect of reducing no of people suffering from hunger and improvement in maternal health is either slow or off-track. As discussed earlier, India’s MDGs framework is based on the 2003 United Nations Development Goals (UNDGs) guidelines on concepts, definition and methodology of MDGs indicators. This framework recognizes 53 indicators (48 basic and 5 alternatives). But the 2003 UNDG framework for MDGs is not followed in toto. The frame work has been contextualized for India. All the 8 Millennium Development Goals, 12 of the 18 targets, namely target 1 to target 11 and target 18 are relevant for India. These 12 targets and 35 indicators under the 8 Goals constitute the instrument for statistical tracking of the MDGs in India. Some of the indicators in lieu of those specified under MDGs were found better suited to the Indian context and in some cases, the non-availability of sufficiently reliable data is the reason for dropping them. Important among those indicators are proportion of population below $1 (PPP) per day, proportion of population below minimum level of dilatory energy consumption, ratio of school attendance of orphans to school attendance of none orphans aged 10 to 14 years, proportion of population with access to secure tenure, unemployment rate of young people aged 15 - 24 years and proportion of population with access to affordable essential drugs on a sustainable basis. It is important to note that that the national statistical system does not have independent statistical machinery exclusively focused on quantitative monitoring of the MDGs. The statistics used in this report as well as in the earlier issues are based on piecing together, from the variety of sources including administrative records, data compiled by Central Ministries/ Departments/ Organizations and information gathered from periodic national surveys and censuses carried out by the Government of India. As discussed above the Report entitled “Millennium Development Goals (MDG) India Country Report- 2014’ captures the achievements in India as of today under the eight MDGs which are to be achieved by 2015. The year 2014, being the penultimate year for the MDGs, acquires significance in assessing realistically India’s progress in meeting the various targets under the MDGS as well as to take a stock of the areas where the progress is not up to the expected level. Ministry of Statistics and Programme Implementation (MOSPI) is engaged in the task of statistically tracking the MDGs on the basis of a data-sets generated by the line ministries/Departments. However, statistical tracking of the MDGs is not easy as there exists several data gaps in the system which hamper smooth Statistical tracking of MDGs. While for one indicator data are not available at all (indicator 22, under Target 8), for others data are available over various time points with long gaps, Population Censuses are conducted once in every 10 years. Consumer Expenditure Surveys are usually conducted every 5 years, and National family Health Surveys are usually conducted after 5- 6 years. Consequently information for inter census or inter survey years are not available. Data available on social indicators from administrative records suffer from incomplete coverage. Some problems relate to methodological issues like the estimation of population below the poverty line. The concept of poverty and the items in the basket of consumption that define the poverty line is revised from time to time making the later estimates not strictly comparable with the earlier ones. Another case is the estimation of Maternal Mortality Ratio (MMR). As maternal deaths are rare event, it requires a large sample size to provide robust estimates of MMR; MMR estimates are not available for smaller States / UTs. More over data for many indicators are not available at sub state (District) level. The all-India Poverty Head Count Ratio (PHCR - percentage below the national poverty line) has declined by 15 percentage points from 37.2% in 2004-05 to 21.9% in 2011-12. Significant decline in Poverty Head Count Ratio has been observed in both rural and urban areas during this period as the rural poverty head count ratio declined by 16 percentage points from 41.8% to 25.7% and urban poverty declining by 12 percentage points from 25.7% to 13.7%. The percentage of people below the national poverty line has already narrowed down to a level less than half of its position in 1990, in 2011-12 itself, at all India level and for rural and urban areas, ahead of the MDG target year of 2015. During 2004-05 to 2011-12, the Poverty Gap Ratio (estimated from monthly per capita consumption expenditure data based on Mixed Recall Period (MRP)) has shown decline in rural and urban areas. In rural areas, PGR declined from 9.22 in 2004-05 to 5.05 in 2011-12, while in urban areas the decline was from 6.08 to 2.7 during this period. The share of the poorest 20% population in terms of the monthly per capita consumption expenditure in total consumption (i.e consumption accounted for by the poorest one fifth of the population) in the rural areas has slightly increased from 9.6% in 1993-94 (based on Uniform Reference Period – URP method) to 9.8% in 2009-10. In the urban areas the share of the poorest 20% population, declined from 8% in 1993-94 to 7.1 % in 2009-10. From estimated 52% in 1990, the proportion of underweight children below 3 years is required to be reduced to 26% by 2015. The proportion of underweight children has declined by 3 percentage points during 1998-99 (NFHS -2) to 2005-06 (NFHS-3), from about 43% to about 40% and at this historical rate of decline, it is expected to come down to about 33% only by 2015. Now let us discuss in detail the different targets of the Goal 1. Status- Faster decline in poverty…. India, the world’s second most populous country is home to 1.2 billion people, which is 17% of the world population. In this country of huge diversities, poverty has always been a cause of great concern always. However, as the Statistics reveals, over the years, India has made significant progress in poverty reduction. The official poverty estimates released by Planning Commission (Tendulkar methodology) based on NSSO Survey on Household Consumer Expenditure 2011-12 reveals that, the all-India Poverty Head Count Ratio (PHCR) has declined by 15 percentage points from 37.2% in 2004-05 to 21.9% in 2011-12. Significant decline in poverty ratio has been observed in both rural and urban areas during this period as the rural poverty head count ratio declined by 16 percentage points from 41.8% to 25.7% and urban poverty declining by 12 percentage points from 25.7% to 13.7%. Though, the nation shows considerable improvement in poverty reduction, it is alarming that, still, 1 in every 5persons in India is below the national poverty line. While considering the progress towards MDG target 1, the estimate of PHCR at the national level was at 47.8% for 19903 and the Country is required to achieve a PHCR level of 23.9% by 2015 in order to meet the MDG target. With a faster decline in PHCR i.e annual decline of 1.9 percentage points during 2004-12, compared to 0.7 percentage points during 1993-2004, the Country has already achieved the MDG target, which is a notable achievement. Improve the lot of the poorest of the poor, is equally important as reducing the quantum of poverty. The indicator of Poverty Gap Ratio (PGR) reflects the degree to which mean consumption of the poor falls short of the established poverty line, indicating the depth of poverty. During 2004-05 to 2011-12, the Poverty Gap Ratio (estimated from monthly per capita consumption expenditure data base on Mixed Recall Period (MRP)) has shown decline in rural and urban areas. In rural areas, PGR declined from 9.22 in 2004-05 to 5.05 in 2011-12, while in urban areas the decline was from 6.08 to 2.7 during this period. The persisting low levels of anthropometric indicators of nutrition in India, for both adults and children even in the midst of intensified initiatives for poverty alleviation, is a cause of great concern. Intake of dietary energy per person continues to be the most widely used indicator of the level of nutrition of a population. The NSSO surveys held during 1993-2010, to study nutritional intake in India, revealed that, estimated per capita calorie intake was more in rural areas than urban areas in all the rounds, except 1999-2000, in which the estimated per capita calorie intake for urban areas was slightly more than rural areas. In both urban and rural areas, declining trend has been observed in the estimated per capita calorie intake per day during this period and there was nearly 6% decline in 2009-10 in both rural and urban areas compared to 1993-94. The decline in per capita calorie intake per day in most of the States in spite of the economic development and ongoing initiatives towards poverty alleviation is a matter of concern. Indicator: Prevalence of underweight children under three years of age. Children are the worst sufferers of poverty and malnourishment among children is a significant indicator of food insecurity. The indicator ‘Prevalence of underweight children’ is the percentage of children under three years of age whose weight for age is less than minus two standard deviations from the median for the reference population aged 0-35 months5. All-India trend of the proportion of underweight (severe and moderate) children below 3 years of age6shows India is showing a slow progress in eliminating the effect of malnourishment. From estimated 52% in 1990, the proportion of underweight children below 3 years is required to be reduced to 26% by 2015. The proportion of underweight children has declined by 3 percentage points during 1998-99 (NFHS -2) to 2005-06 (NFHS-3), from about 43% to about 40% and at this historical rate of decline, it is expected to come down to about 33% only by 2015. As per NFHS -3, in India, one in every three children in the age group of 0-3 years is suffering from under weight. Census 2011, reports nearly 89 million children in the age group 0-3 years and with the 40%7 prevalence of underweight, 35.6 million among them are underweight children. The statistics as discussed above, points out that, majority of the States are crippled with the problem of malnutrition and the issue invites special attention in the context of declining trend observed in per capita nutritional intake. The gap existing in the present nutritional status among children (measured by prevalence of underweight children) from the MDG target and the declining trend in the estimate per capita nutritional intake per day in majority of the States indicates the complexity of the issue of malnutrition and hunger. Poverty is a complex and multidimensional phenomenon. The institutions addressing the issues of poor therefore need to engage in many sectors and with several service providers. The Government of India has taken a number of initiatives towards eradicating poverty and hunger as poverty remains to be the major hurdle towards sustainable development in the Country. Overall, despite the numerous challenges faced in the measurement and in the implementation the government is committed towards combating poverty and hunger. A number of programmes are being implemented by Central as well as State Governments to tackle the burden of poverty and hunger in this Country. The focused efforts to improve the lives of poor in all fronts need to be continued in a sustainable manner so as to overcome the challenges of future too. The poverty line is an abstraction that's essential to measure how poor a country is. Behind statements like, `40 per cent of Indians are poor,' there is an implicit poverty line. India draws a poverty line by calculating the `minimum' cost of living that can sustain people. For very poor country like ours, this boils down to a nutritional requirement: the cost of the minimum number of calories needed to keep people alive. Lorentz Curves Lorentz curves are used to illustrate the distribution of resources in a community/society/nation. The Lorenz curve is a graphical representation of the cumulative distribution function of a probability distribution; it is a graph showing the proportion of the distribution assumed by the bottom y% of the values. It is often used to represent income distribution, where it shows for the bottom x% of households, what percentage y% of the total income they have. The percentage of households is plotted on the x-axis, the percentage of income on the y-axis. It can also be used to show distribution of assets. In such use, many economists consider it to be a measure of social inequality. It was developed by Max O. Lorenz in 1905 for representing income distribution. Gini index is a measure of inequality in the income distribution in an economy. The index measures the extent to which the distribution of income (or, in some cases, consumption expenditure) among individuals or households within an economy deviates from a perfectly equal distribution. The Gini index is helpful for tracking inequity over time, or comparing distributions of resources among countries. 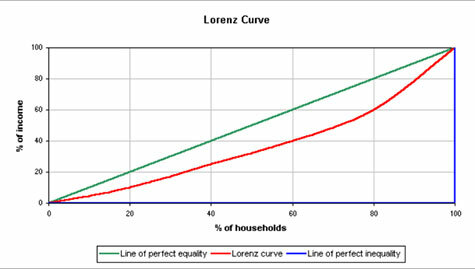 The Gini coefficient is the area between the line of perfect equality and the observed Lorenz curve, as a percentage of the area between the line of perfect equality and the line of perfect inequality. (This equals two times the area between the line of perfect equality and the observed Lorenz curve.) The higher the coefficient, the more unequal the distribution is. India's poverty line is calculated by asking a key question: how much would a person need to spend to get this minimal basket? The answer gives an expenditure figure, which is the poverty line. People whose spending falls below this number are poor -- `below the poverty line'. Poverty is a very sensitive to price index. Every five years, the governments National Sample Survey Organisation (NSSO) surveys huge number of household across the country for getting data on consumption expenditure. The information is used in construct and update the Consumer Price Index especially for Agricultural labour for rural areas and Consumer Price Index for Industrial Workers for Urban India. Based on these surveys, the poverty ratio that is the proportion of people living below the poverty line or the minimum consumption expenditure level is estimated by the Planning Commission. It is to be noted that the NSS survey results are used for other purposes also. The commission now calculates poverty line at the state-level also. As mentioned earlier the poverty line is implicit in the sense that it should be deduced from the way it is defined. The implicit poverty line in India is defined by the monthly expenditure each person required for a daily intake. It is 2400 calories for rural area and 2100 calorie for urban area. Millennium Development Goals India Country Report 2014 by Ministry of Statistics and Programme Implementation Government of India.